Diagnosing a Networking Duplex Mismatch can be a daunting task. The NETSTAT command can help. 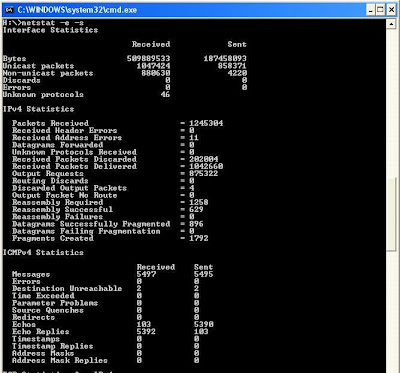 Netstat will then produce a list of statistics for the network interface. If you see Errors or Discards, chances are pretty good the workstation is experiencing the duplex mismatch issue. Trace the port the workstation is connected to on the port on the network switch it is connected. Next check the switch port for errors and reconfigure it if errors are found. If the workstation is set to auto-negotiate, set the switch port to auto-negotiate. The reason for this problem is that most devices when configured for full duplex will not auto-negotiate. And according to the auto-negotiation specification, the side trying to auto-negotiate must fall back to half duplex mode when it does not see the auto-negotiation protocol from the link peer. This is a mute issue with Gigabit connections as nobody supports half-duplex Gigabit Ethernet.